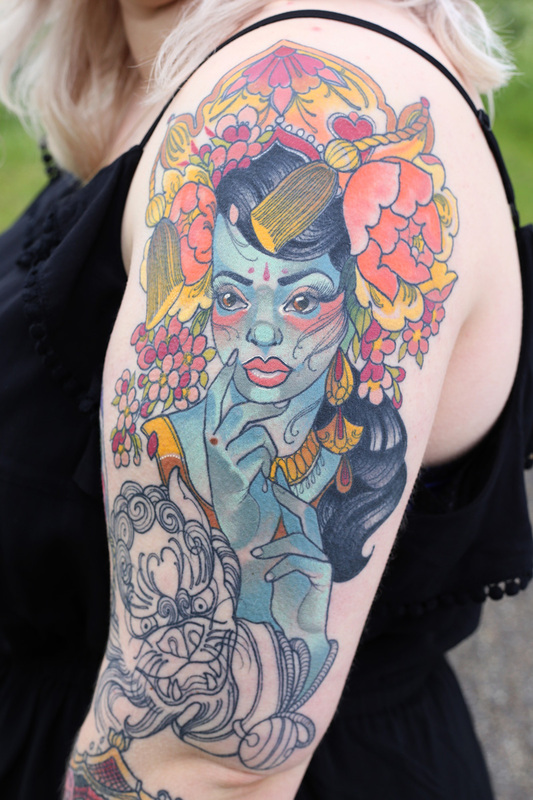 Turquoise, peach, rich reds and sunset orange: Rosie's tattoos are a feast for the eyes. What drew you into the world of tattoos? It all started when my boyfriend booked in to get his first tattoo. I was 18 at the time. If he was going to get one, so was I! I had always wanted one, but until then hadn’t really thought about it or had the guts to go through with it. My family have always been pretty against them. I remember one of my uncles getting a small football team badge when I was younger and everyone hating it. I've always loved henna and mehndi-style patterns so I decided to start small with a floral design on my foot. I was totally unprepared for the pain that I never got it finished. I just couldn’t sit still so there are some wonky lines, but it is mine and reminds me of that time in my life. It took me three years to pluck up the courage to get another tattoo. When I eventually did, I got a small fortune fish. I am obsessed with lucky symbols and talismans from different cultures and I’m secretly hoping these things will bestow on me some much needed luck! 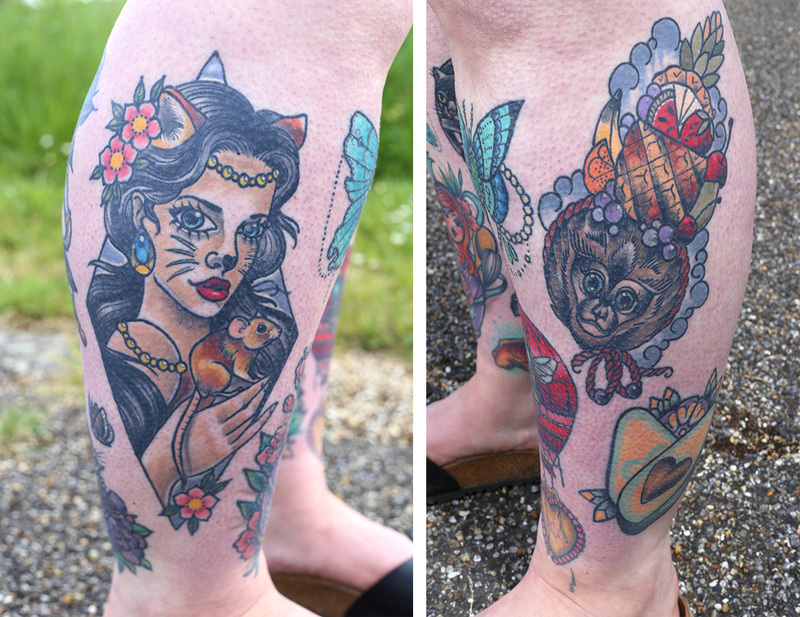 The lovely Sophie Adamson tattooed me and continued to tattoo me for most of my university years. She started my tattoo heyday; in the midst of it I was getting a new tattoo every week. I just loved spending time with Sophie and, of course, I adored everything she created for me. Right now, they’re kind of a hobby and also a labour of love. 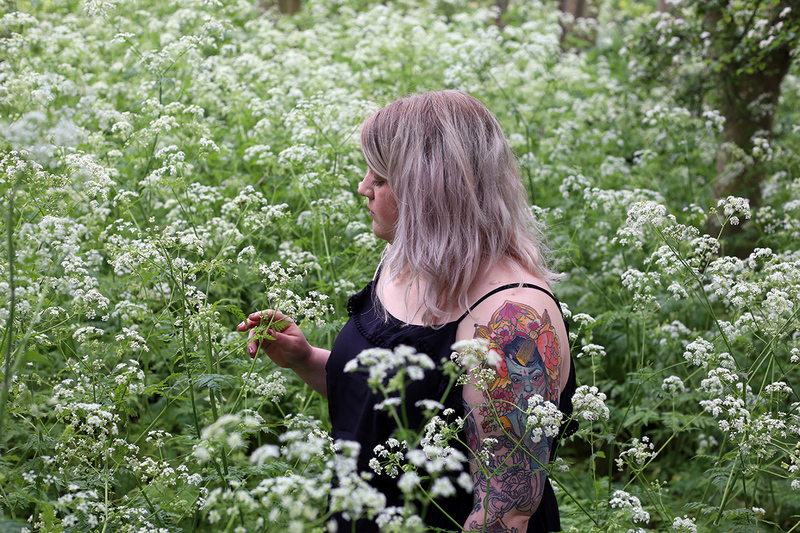 Being involved in Things&Ink has opened a whole world of tattooing to me. 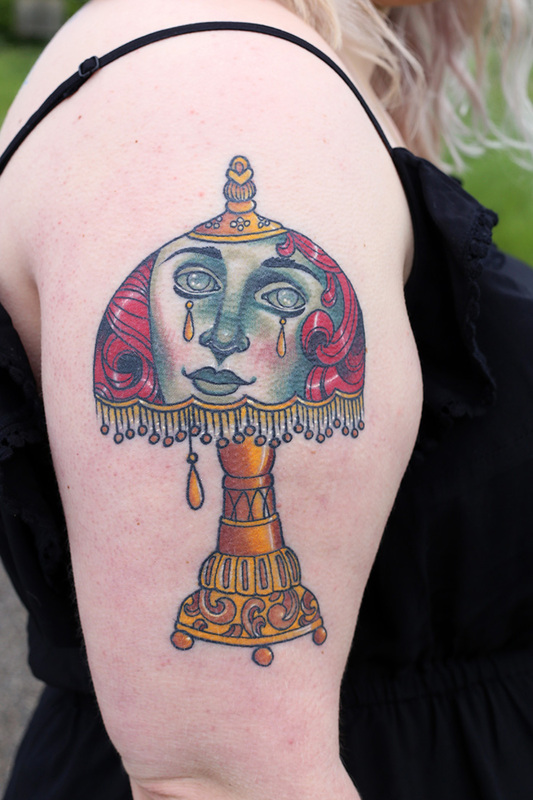 I can interview, write about and research tattoos for hours! Without the magazine and blog I probably wouldn't be as tattooed as I am and I wouldn't have found so many awesome artists. Also my list of people I need work from wouldn’t be so long or frustrating. Tattoos have allowed me to meet some awesome people, make new friendships and travel the country. I’ll always be grateful to Alice (the editor) for the wonderful opportunity she has given me. 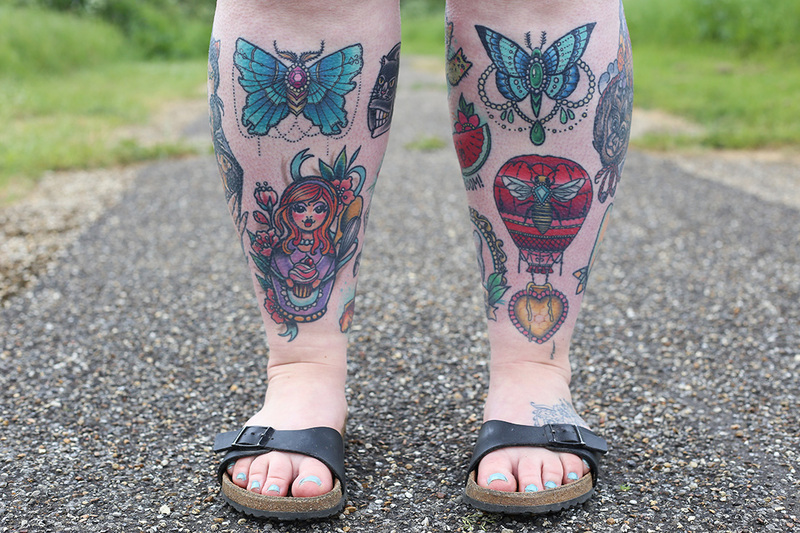 Why do you think that tattoos help people feel more confident? I’m not sure about everyone else, but with every new tattoo, I begin to love my body that little bit more. I see it as an empty canvas that I can fill. A tapestry that I alone can weave and create, a thing that I can change in a positive way rather than something that I feel negatively towards. I can make it my own and no one else can dictate what I decide to do with it. 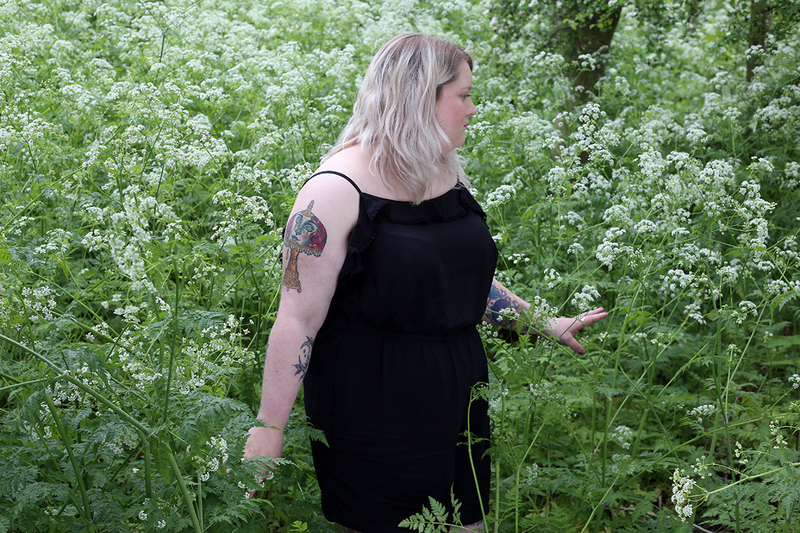 Now when I look at my body, I see the blank spaces that need filling, the possibilities and the gaps that have been mapped out for artists and ideas. Tattoos have become a way for me to celebrate myself and my body, a way for me to not only express and explore myself but find out what I find important in life. Tattoos are beautiful pictures that we carry with us. They become a part of us. They sink into the skin, capturing memories, a moment and the person you are today. If you had to explain what a tattoo is to a child, what would you say? It depends whether an artist has drawn some flash that I love or whether I love their style and want them to create something. 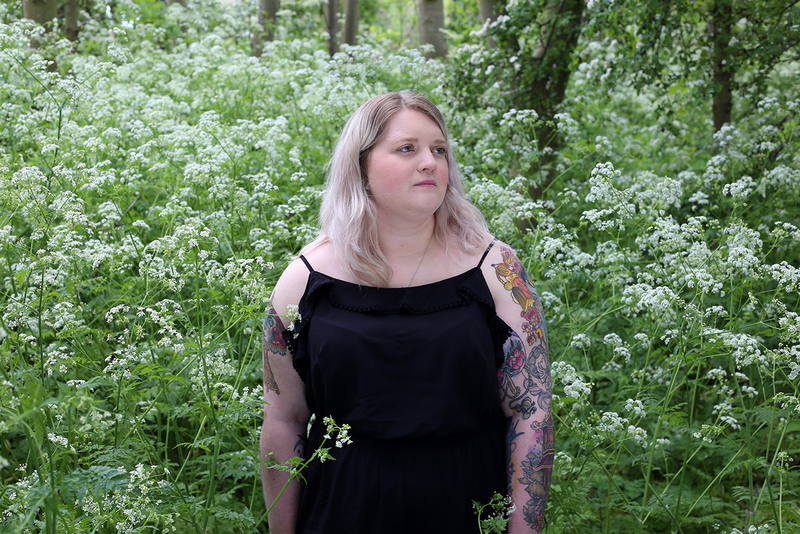 My left sleeve by Lucy O’Connell is two years in the making. I've always loved oriental styles, culture and objects. A trip to Vietnam last year to visit a friend really cemented my love for the Far East. I fell in love with the country that I saw from the back of my friend’s moped, from the beautiful pagodas to the street food. Being in a completely different country with some of my closest friends really helped me decide what direction I wanted my arm to go in. This sleeve is not just beautiful, it’s a tribute to the time we spent together and how important these people are to me. Is a tattoo artist's personality important to you? I know someone who makes sure she meets the artist before deciding to go ahead with them. I tend to get tattooed by mainly women, who I always feel more comfortable with anyway. I guess I just prefer the company of women. 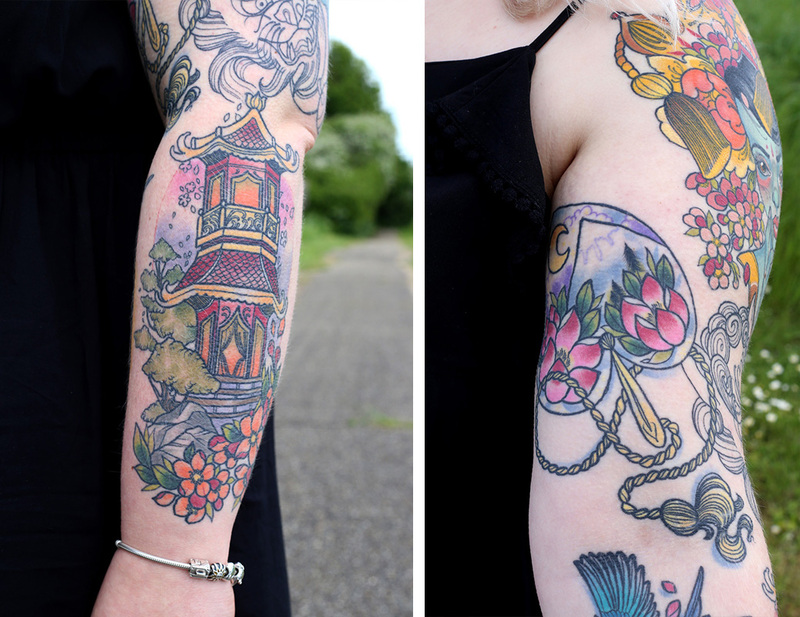 I also find that the styles of tattoo that I go for - bright, colourful and girly - tend to reflect those who create them. I have met a couple of tattooists at conventions that I didn’t click with or I got a bad vibe from and so I won’t be getting tattooed by them, no matter how much I like their work. If I get on with someone I definitely tend to get tattooed by them more, especially if they enjoy tattooing what I have commissioned. If I have fun - well, as much fun as you can have getting tattooed - I usually feel a lot better about the tattoo. I associate the person, jokes, music or the time in general with how I feel about the completed tattoo. 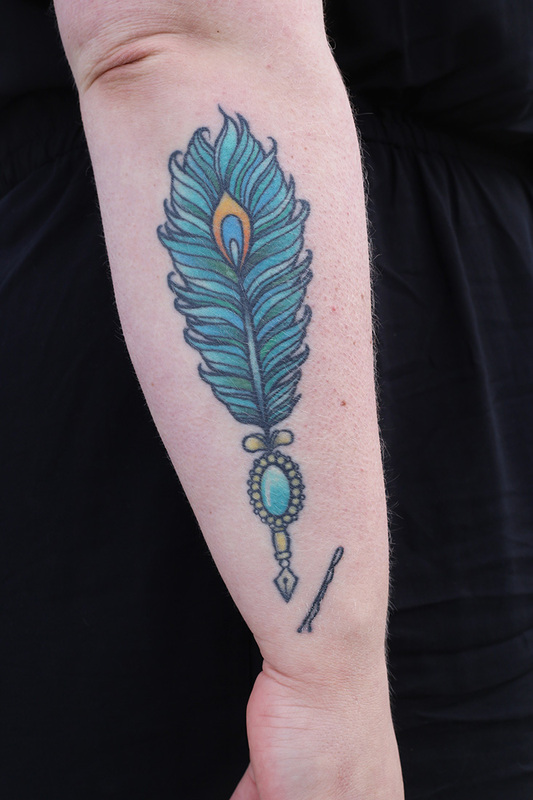 You work in digital media and I wondered how you feel Instagram has changed the tattoo scene? I've only known the tattoo scene since Instagram. Before then I didn't know a lot about it, except just the local shop in our town. I think it’s amazing for the industry. There are so many amazing artists to discover and find all over the world. I spend way too much time on Instagram, finding new tattoo inspiration and generally wasting time! 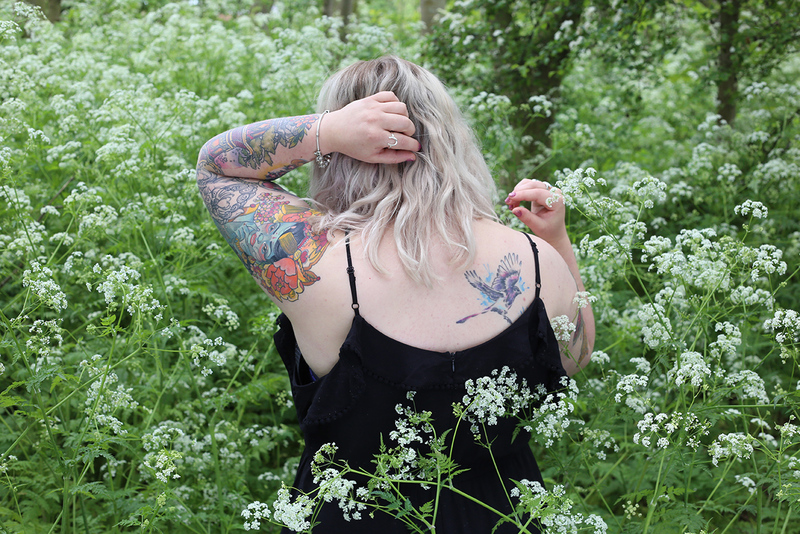 Everyone I have been tattooed by I found on Instagram and anyone I have chatted to for the magazine or blog I have found on the app. Instagram opens up tattoos to copycats and trends, but it also allows us to feel a wider sense of community and belonging. What advice would you give someone who was thinking about getting their first tattoo? Firstly, find a good artist whose style you love – there really is no excuse with social media now. Don’t just go to your local artist because they’re cheap or your friend went - tattoos are worth travelling for. They’re an investment, they’re worth waiting for. It’s great to draw inspiration from other people’s work, but get your artist to draw something custom for you – it’ll have more meaning and will age better with you in the long run. Saying that, not every tattoo has to have some grand meaning or story. With each new one I get I tend to notice them less. They just become a part of me that will always be there. Be true to yourself, don’t follow fashions, these are fleeting, it is your skin forever, adorn it with beautiful things and just do it!